French restaurant Villandry offers a Thanksgiving meal with a Mediterranean twist. Expect the usual roast turkey with all the trimmings, but with butternut squash soup as a starter and pumpkin pie for dessert. You can get three courses for £45 a person. Big Easy is the ideal restaurant to head to on the 24th November if you've got kids. It's a family-friendly American chain with branches in Canary Wharf, Covent Garden and King's Road, and it puts on a great Thanksgiving feast every year. Be sure to try the Jack Daniels-infused pumpkin cheesecake. 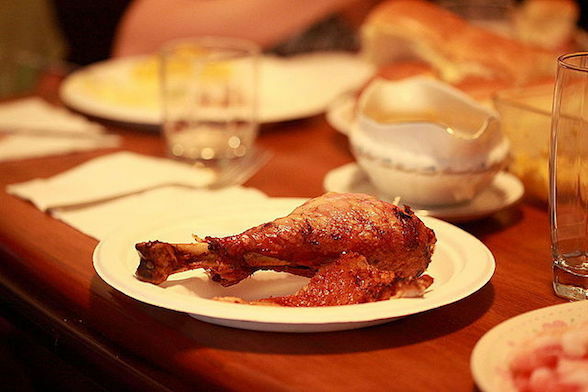 US BBQ restaurant Q Grill is located in Chalk Farm and offers a mouth-watering Thanksgiving menu, which includes roasted pumpkin soup, truffled mac n cheese, key lime pie, and of course, roast turkey. The meal costs £35 per person. Plant Hollywood is an iconic American restaurant in Haymarket. You will be surrounded by plenty of memorabilia from Hollywood video screens and a live DJ. Why not complete your meal with a cocktail? The list includes Planet Hollywood specials such as Legally Blonde, The Dark Knight and Titanic. Royal China offers diners unique Thanksgiving dishes that fuse together Asian and American flavours. The menu features Empress Chicken with Ginger and Spring Onion and Almond flavoured Pumpkin Soup with Crabmeat. Book in advance to avoid disappointment. If you feel like splashing out this Thanksgiving, you've come to the right place. At £70 per head, the Thanksgiving menu at the exclusive Morton's Club isn't for those with a tight budget. Start your meal with a plate of scrambled eggs or tagliolini or risotto served with Alba white truffle, and follow with veal sweet bread, chestnut gnocchi or roasted grouse.